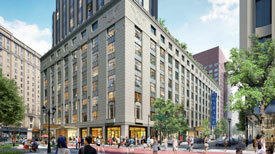 Back Bay clearly is a destination for development in the City of Boston. If falls outside the FAA’s domain and doesn’t interfere with the “shadow effect”. One prime example is the Motor Mart Garage at 201 Stuart Street in Boston. “The project’s height was considered as a continuation of the high spine of Boston,” the development team wrote in the Sept. 10 project notification form. Additional details on the redevelopment are available on the Boston Business Journal, or you can view the detail page for further information Back Bay office space.